Wooden star shapes are easy to find at your local craft store. 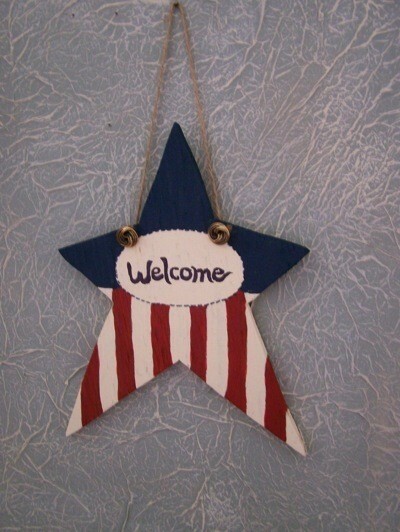 Decorating them with red, white, and blue paint or other mediums gets you started on making patriotic decorations for your home and garden. 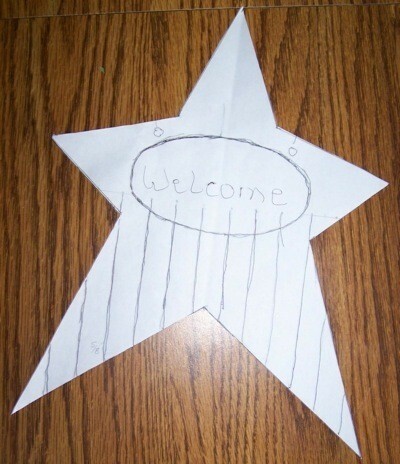 This is a guide contains instructions for making a patriotic wood star craft. Lay your pattern on the best side of your wood, trace all lines using carbon paper. My pattern happened to fit on a piece of copy paper, but feel free to enlarge or shrink it as you want. You could make a large one to hang on the outside of your house or 4-5 inch ones for a tree or garland. Cut out on the outside line; drill the holes for your hanging cord. Sand somewhat smooth, it doesn't have to be perfectly smooth for painting this design. Paint your white lines and white welcome circle first as the darker colors will cover the white better. Make sure to paint down over the edges matching the 13 stripes. Paint your blue last. Let dry and paint your wording, you could put a name or whatever you wish. Maybe paint three gold stars instead of a word. Bring your jute or wire through the holes from the back, run through the shank of your buttons if you chose to use them, tie a tight knot and show your pride in our great country.